Sure, the plaque is nice. 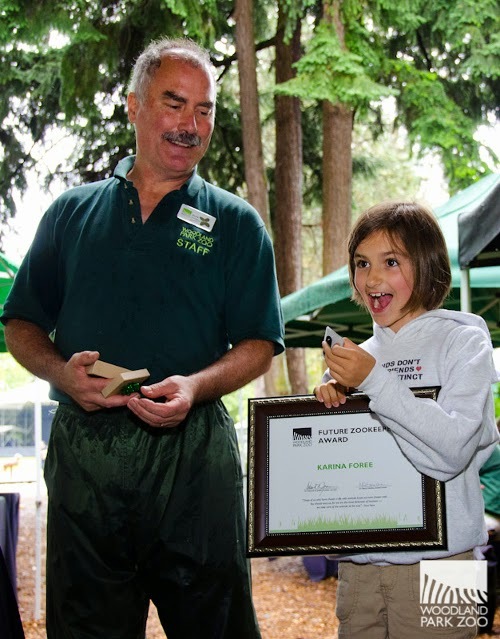 But the real prize in receiving the Future Zookeeper Award for 9-year-old Karina is the official Woodland Park Zoo name badge that reads simply, "Karina, Future Zookeeper." Her eyes lit up when she received this badge of honor at yesterday's annual zookeeper picnic, part of the zoo's National Zookeeper Week celebrations. Many of the most memorable visitor experiences at Woodland Park Zoo come from connecting with the animals we've grown to know and love. It’s where Karina’s adoration for elephants took hold nearly seven years ago and, to her surprise, where an unlikely friendship continues to grow with every return to the zoo's Elephant Forest. Karina as a youngster watching after her favorite animals at Woodland Park Zoo. Photo by Julie Foree. Often overshadowed by the magnificence of our trunked trio is a dedicated team of keepers that care for our elephants day in and day out—but their commitment is never overlooked by Karina. It’s her connection to our keepers that makes her a part of the herd, most notably the friendship she’s found in elephant keeper Russ Roach. 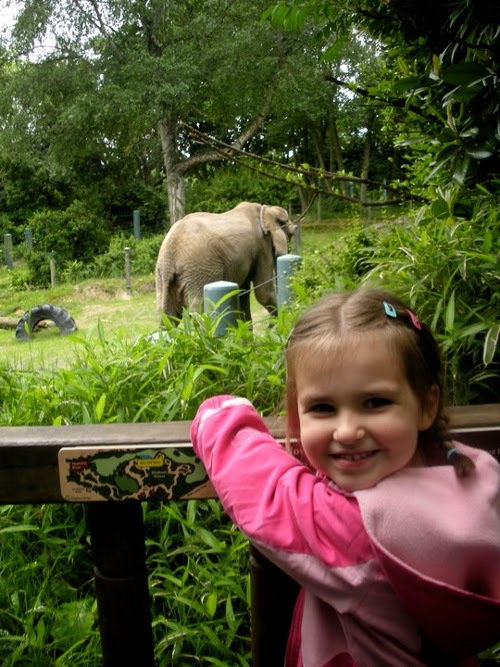 Karina and her family first met Russ in 2007 during one of our popular elephant keeper talks. 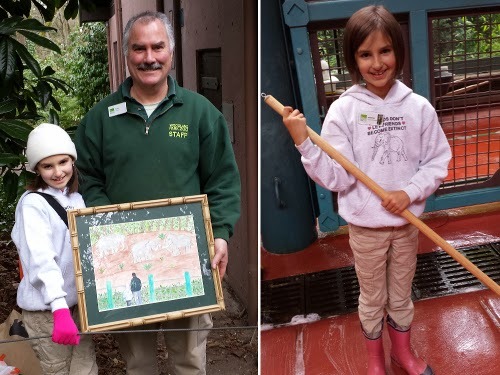 Inspired by Russ and his wealth of knowledge about Watoto, Bamboo and Chai, Karina took it upon herself to learn as much as possible about her favorite three residents at Woodland Park Zoo and soon became a young ambassador for the animal she treasures most. 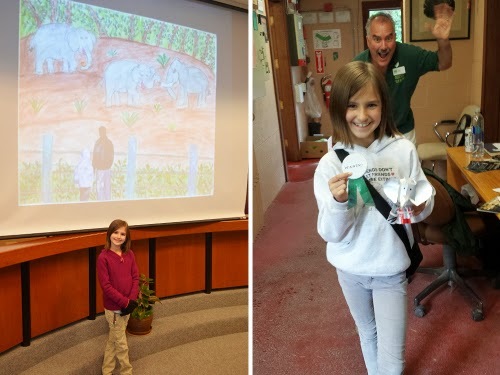 As an ambassador for elephants worldwide, Karina has received many school and community awards for her creativity and conservation efforts. Great work, Karina! Photos by Julie Foree. Her frequent visits, endless curiosity, and great affection for our herd make Karina well-known among keepers at the elephant barn. But earlier this month, Karina was introduced to a new elephant keeper being trained at the zoo. Uncertain why she hadn’t been considered for the job, Karina reached out to Russ who playfully encouraged her to drop off her résumé for future openings. She returned with her résumé in hand, boasting a lengthy list of reasons why there’s no better person for the job. A copy of Karina's résumé. Karina has looked to Russ over her many years of zoo visits to understand the great responsibilities that come with caring for elephants, including morning baths, training sessions, exhibit up-keep, and of course, scooping poop. But not even the dirtiest work keeps Karina from envisioning the irreplaceable reward of a career in zookeeping. The constant interaction Russ and the keepers have with Watoto, Bamboo and Chai builds a strong bond among the herd, of both humans and elephants. 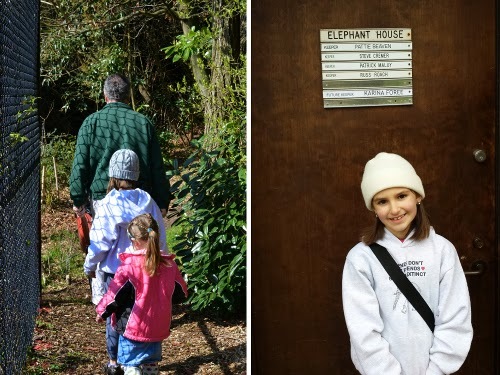 To Karina, Russ’s 24-year career as a Woodland Park Zoo elephant keeper is a testament to that, and a future she very clearly imagines for herself. Russ leading Karina and younger sister Makenzie behind the Elephant Forest exhibit area (left). No stranger to the Elephant Barn, Karina's name makes the list as "Future Keeper" (right). Photos by Julie Foree. Walking side by side through the elephant barn, the admiration Karina holds for Russ is as evident as her affection for the animals in his care. She patiently watches with her sisters as Russ moves through his daily keeper routine, but it’s not long before the girls are pleading to help scrub the barn floors. Donning her Future Zookeeper name badge, Karina gets right to work with her gleeful sisters. There’s not a shadow of doubt she’ll rise to the ranks of a Woodland Park Zoo keeper one day and follow in the footsteps of a most cherished friend, her favorite zookeeper Russ. Karina gifting her award-winning artwork to keeper Russ (left). Karina volunteering her assistance in her favorite place, the Elephant Barn (right). Photos by Julie Foree. 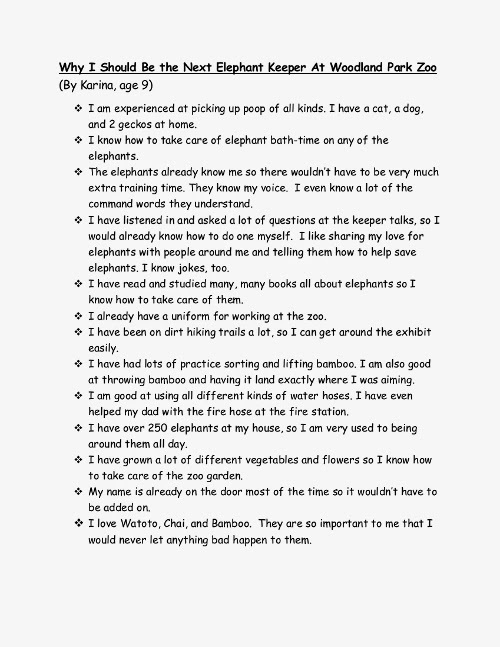 Karina's love and devotion, both to the elephants and the keepers, has grown through the years. The keepers have taught her well and encouraged her. A lot of credit should also go to her parents, who recognized this special interest and have given of their time and effort to allow it to grow. Now both of Karina's sisters have favorite animals at the zoo and are developing relationships with the other keepers, too. Woodland Park Zoo is a very special place. Can I do the same for the reptile department? :( I would love to clean their cages.